Do You Need to Tidy the Home Before the Cleaner Arrives? We all have those anxious moments when we feel that our home is being judged by those who visit. This is true of many people who hire home cleaning services. Oftentimes, you might feel that you should prepare your home ready for your cleaner to arrive and complete the work. But you don’t have to give in to this temptation! As specialists in the marketplace, our team has cleaned thousands of properties across the region. We’re used to the clean-up work and committed to comprehensive service! When you hire a professional to clean your home, that professional should be ready to clean all types of residential waste. When a homeowner hires our staff for the work, they can rest assured that our staff is trained to complete their cleaning work to the highest of standards. 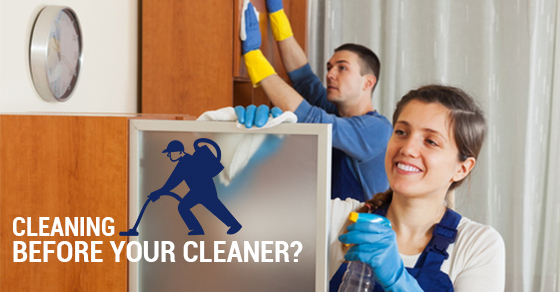 They take pride in their work and don’t require the home owner to pre-clean the home for them. When you’ve hired a specialist to clean your home, that time has been allotted to the service specialist and will be used to complete all cleaning processes. When you complete pre-cleaning work, you’re actively adding further time to the process. This will take time out of your busy schedule and reduce the value of your investment within professional cleaning work. The leading companies use trained specialists who can complete comprehensive cleaning work far quicker than the average homeowner. It’s why you hire cleaning specialists in the first place. While you might wish to complete easy tasks such as loading the dishwasher and moving dirty towels into the laundry, it’s more than okay to leave the tougher cleaning tasks to your professional home cleaner. De-cluttering the space can help the service expert to focus on the more challenging work, but you should only complete small tasks that won’t detract from your daily routine. Professional home cleaning work can transform an untidy residential property into a highly functional and appealing living space. Make sure you’re getting full value for your residential cleaning work – sit back and leave the tough jobs to the professionals. You’ll be able to relax while gaining many hours in your day-to-day schedule!